Here’s how how the 2016-17 playoffs shake out according to our advanced stats model. And, of course, the two best teams are in the same division. The playoffs are finally here and it’s time to make some predictions for who wins it all. While it’s fun to go with gut instinct and favouites, it helps to be as informed as possible too and that’s where analytics can be very useful. Analytical prognostications have become a lot more sophisticated over the past few years. Before it was just a matter of looking at a team’s Corsi, considering their goalie and calling it a day. Now there’s more and more statistical models being used that try to account for as many important things as possible to get a better picture of team quality. Last season was a good lesson for how powerful math can be. We had a piece running throughout the playoffs that compared two models: one that uses just numbers and one based on a survey of hockey people. The numbers came out on top and it was the same case when comparing other models with public perception and expert picks. Math won, ignore it at your own peril. Year after year, the numbers generally seem to have a stronger read on what’s going to happen and while there will be misses on both sides, the track record for the numbers are solid. That’s generally speaking of course, and this could be the year where everything goes wrong for the nerds – I just wouldn’t bet against them. We’re using a different model than the one from last year’s playoffs, this one being entirely player-based making it easier to account for injuries. It’s the one we’ve been using and referencing all year based on my own stat called Game Score, a combination of different box-score stats to measure player value. The model is explained more in-depth here. Without further adieu, here’s how how the 2016-17 playoffs shake out according to the model followed by some thoughts on the results. (I’ll be updating this chart daily here). 1. Washington is unsurprisingly the team to beat and it became that way as soon as they acquired Kevin Shattenkirk to stack their backend. From top to bottom this team looks nearly unbeatable. Their forwards are top notch in both quality and depth and they have one of the best goalies in the league to go along with an unbelievably deep defense group. This really does seem like their year and they got a cupcake matchup with Toronto in the first round to warm up with before having to deal with the real threats. Still, we have to recognize that it’s a lot more likely someone else wins. Even the best team has a one-in-five chance to win it all, and that’s a product of NHL parity and hockey’s inherent randomness at play. You need a lot of luck on your side to go all the way and if Washington doesn’t get it I don’t think that’s an indictment of the strength of their team. This is the best team in the league, something almost everyone can agree on. Most of the time that team doesn’t win. 2. What helps Washington a lot though is the big Kris Letang injury. I actually had the Pens as Cup favorites before the injury announcement (assuming everyone else was healthy) and while they’ve still got a very good chance, they’ll be in tough to beat the Caps. That’s if they both get there which is no guarantee. 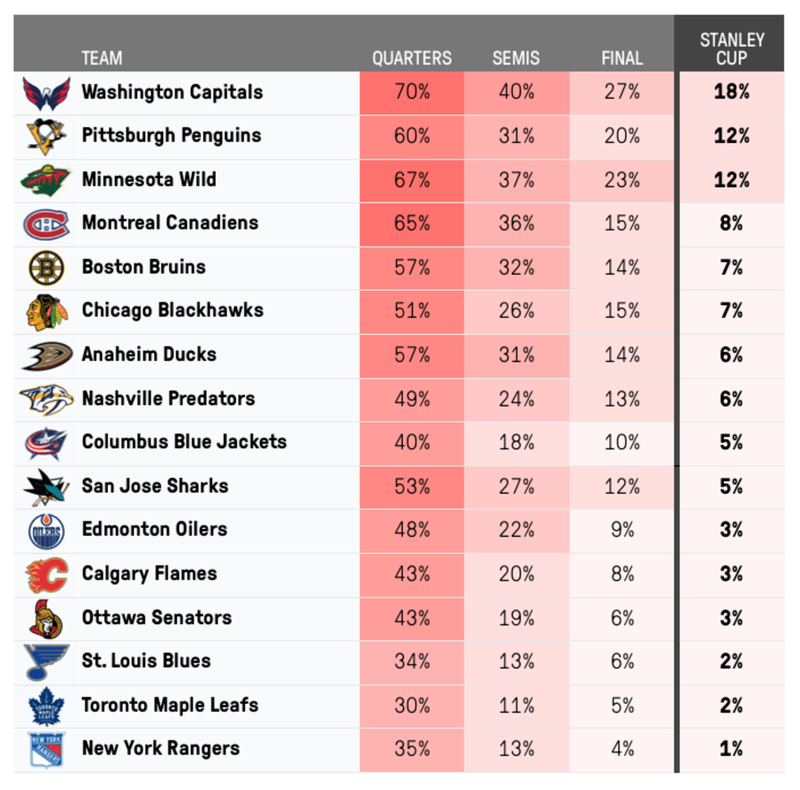 Columbus is a strong team and while the Pens are pretty big favorites, the chances both them and the Caps go through is just 42 percent, meaning it’s more likely we see a different match-up than one between arguably the two best teams in the league. Even without Letang, the Cup runs through those two teams in my opinion. I’m not betting against Sidney Crosby and Evgeni Malkin and you shouldn’t either. Their defense is a rag-tag group of misfits currently led by Justin Schultz, but they’re all mobile puck-movers that can get it up to the deepest forward corps in the league. They’re not as strong as the team that won it all last year, but I wouldn’t count them out. 3. To many, it feels like Chicago is the team to beat out West, but they’re more vulnerable than they seem this year. Look back at their Cup-winning teams and you’ll see their ability to push play isn’t at the same level as their ability to score, which might suggest they come back down to earth a bit in the playoffs. What they have though is a very good group of players and a terrific goalie that can push that goals percentage higher than their shot share. Maybe not as much as this season, but it’s not a stretch to assume Chicago is better than their Corsi suggests. In fact, this model is actually a bit more bullish on the Hawks chances than others, mostly because it believes their team talent level is better than their possession results indicate. They’re a top three team in the West, which is a compromise that’ll likely anger both the old-school (who see them as the unquestioned best) and new-school (who see them as a bit overrated). 4. The team directly above them according to this model happens to be the one they’re playing in Round 1. Chicago has a very slight edge in the series primarily due to home ice advantage, but the fact it’s nearly a coin flip is probably a lot closer than most might suspect. I really do believe in Nashville this season and I think they’re this year’s Dark Horse team (FWIW, last year’s was the Sharks). 5. The winner of that series likely has to go through Minnesota who most analysts peg as the actual team to beat from the West. I know they’ve been brutal lately, but that’s been mostly bad puck luck – their ability to control play has only improved since the deadline and they’re a scary team going into the playoffs if they get some bounces. Nashville has the deep D, but I don’t believe there’s a deeper forward group out West than Minnesota’s. They may have no true superstar, but the top nine might as well be three first lines. Good luck stopping that. Devan Dubnyk’s play of late has been concerning, but he’s a good goalie and the overall team defense is very good. I see a big bounce back in the playoffs. A lot of people think St. Louis is a big threat to their chances, but I just can’t picture it. This isn’t the same Blues team that made it to the third round last year. Outside of their stars – Vladimir Tarasenko, Jaden Schwartz, Alex Pietrangelo, Colton Parayko – there’s really not much else to like on this team and if those guys get shutdown I’m not sure their depth can carry them. Adding Vladimir Sobotka is a low-key big deal though, especially if he pushes one of their fourth liners out of the picture. The X-factor is behind the bench. This model knows these players mostly based on how they’ve played under Ken Hitchcock. The sample size is small under Mike Yeo and they’ve been much better with him at the helm so maybe they’re being underrated here thanks to coach effects. That’s something to keep in mind. 6. One other big coaching change happened in Boston and they’ve also been dominant ever since. I have reservations about whether the change was the cause or whether the talent was there all along, but either way this team is legit and should handle Ottawa with ease. Some might be surprised to see Boston as the sixth most likely team to win it all, but this is actually much more bearish than other outlooks which range from eight to 13 percent. Corsi isn’t everything, but it’s hard not to like the league’s best team as a potential contender. The strength here is at forward, and while it’s mostly top heavy, it’s a damn good top and they’ve made some good adjustments to balance things out. Patrice Bergeron and Brad Marchand are arguably one of the league’s best duos and putting David Pastrnak with David Krejci gives the team a second unit that’ll be tough to stop. Their bracket helps a lot as Ottawa looks like a real paper tiger. They’re the only team in the playoffs with a negative goal differential. Tough to win when you can’t outscore the other team regularly, and while the system worked in the regular season I wouldn’t trust it here. They’ve got a better shot with Torey Krug out, but I’m still really skeptical they can amount to much, especially with Erik Karlsson not at 100 percent. 7. The other matchup there is Montreal vs. New York and it doesn’t seem like it should be all that close, especially if 2016-17 Henrik Lundqvist shows up. I’m willing to admit this model underrates the Rangers offensive ability, but they still don’t have a superstar talent up front, their bottom line forwards don’t seem as strong as their reputation indicates and that defence of theirs is still pretty tragic. It could be the worst group in the playoffs. The team doesn’t push play very well and heck, their goal share at 5-on-5 isn’t that great either. I’m not sure what there is to like about this team other than their point total, and that’s why they’re the least likely to go the distance. Putting Tanner Glass in for Pavel Buchnevich doesn’t help matters either. That brings up their opponent who I think a lot of people are really sleeping on. This is the best collection of talent Montreal has had in a long while and they’ve been playing even better under Claude Julien, which again is difficult to account for. That’s excluding their fourth line which is pretty bad as is, but could be even worse with more minutes to Steve Ott and Andreas Martinsen. The top nine and defense are strong though and there’s also the whole Carey Price factor that can’t be ignored. He can win a series on his own. He’s got a .937 save percentage since Julien was hired, second only to Sergei Bobrovsky in Columbus. Bob has some tougher matchups to deal with in Pittsburgh and likely Washington – Price’s path to the third round is much easier. Montreal is the third most likely team to be in the final four behind Washington and Minnesota. Mostly, it’s hard to be impressed by any of the four teams (and why I wish Nashville could’ve taken the first wildcard) who all have their flaws. Anaheim and San Jose are the best of the bunch here, though they come into the playoffs trending in complete opposite directions. Anaheim has been really good lately, but it’s hard to believe whether it’s real or not. Their top six is really strong, but their fourth line could be one of the worst in the league. Their defense is also good, but their depth is lacking without Cam Fowler. They’re probably the favorites to come out, but they also probably get smoked by the Central. San Jose looks like a shade of last year’s team. Their defense looks as strong as ever, but the forward group doesn’t seem all that imposing, especially if they spend any time without their top two centres. I’m not all that confident in Martin Jones either – he could be the worst starting goalie who qualified for the playoffs. I don’t think it’s the year for either Alberta team to do much damage, but both California teams at least look beatable so they should be able to keep things close. Edmonton’s depth worried me once, but their second line has come on very strong lately. They also happen to have arguably the league’s best player in Connor McDavid and he’ll be very tough to contain. For Calgary, it’s a matter of depth and while they have some real good high end talent, the bottom of their roster is really questionable, especially their bottom pair. All the Pacific teams just seem a little too top heavy for me with little support to believe they can be a legit Cup threat, even if one of them is guaranteed a spot in the final four.